Price: £7.99 (incl VAT) Sorry, this item is currently unavailable. Click here to receive notification when this product comes back into stock. 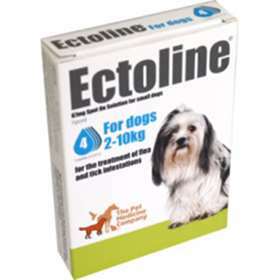 Ectoline spot on solution for dogs. For the treatment of flea and tick infestation. The product has a persistent insecticidal efficacy for up to 8 weeks against fleas and a persistent acaricidal efficacy for up to 2 weeks against ticks. If ticks of some species are present when the product is applied, not all the ticks will be killed within the first 48hrs but they may be killed within a week. The product can be used as part of a strategy for the control of flea allergy dermatitis (FAD) where this has been previously diagnosed by a veterinary surgeon. Hold the pipette upright. Tap the narrow part of the pipette to ensure the contents are within the main body of the pipette. Break the snap-off top of the spot-on pipette along the score line. Part the pets coat until its skin is visible and place the tip of the pipette directly against the bared skin and squeeze gently several times to empty its contents. Repeat this procedure at one or two different points along the cats back, preferably at the base of the head and between the shoulders. In the absence of available data, the product should not be used on puppies less than 2 months old and/or weighing less than 1kg. The picture displayed for this product is of the 4 pipette pack, if you purchase this product you will receive the 2 pipette pack. Product code: 3640301 Price: £7.99 (incl VAT) Sorry, this item is currently unavailable. Click here to receive notification when this product comes back into stock.